Let’s start the week off with a little bit of progress from some weekend bouts of stitching! Besides, it’s Monday, and a big splash of color is good for the soul on a Monday morning! For those of you just joining in, this projects is a Miniature Tree of Life tapestry designed by Natalia Frank and worked on 56-count silk gauze. You can read all about the project itself here in my kit review, and how I set it up here, if you want additional background information. 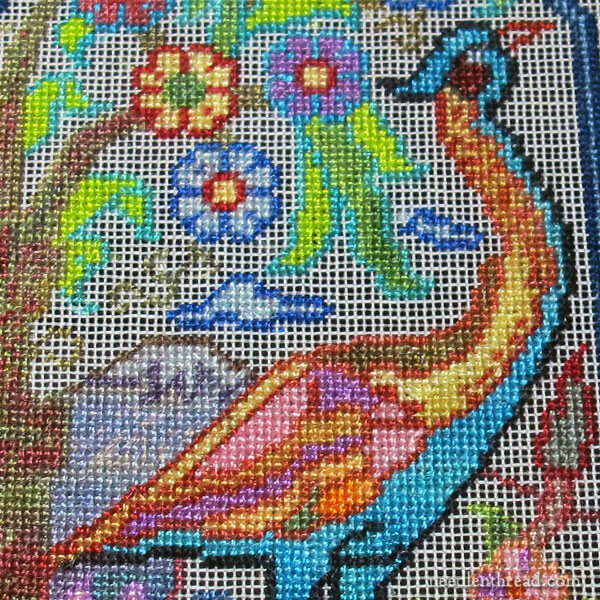 Over the weekend, I finished everything but the background on the peacock panel, which I introduced you to here. Since this particular project isn’t my main stitching focus these days, I’m surprised at how quickly it develops! Perhaps it’s the fact that the design is broken up into all these little pieces that can be attacked in short little stitching sessions. Perhaps it’s the fact that it’s a great project for relaxed stitching sessions. At the end of the day, I tend to pick it up for about an hour before going to bed. It sets me up for a good night’s sleep! Whatever the case, I didn’t intend for it to be a quickly-developing project. But this weekend was a bit of a hodgepodge of comings and goings, and I couldn’t get stuck into other work. I found myself turning to this again and again for a little bit here, a little bit there. When looking at the different panels and medallions up close on this project, I find my mind boggling at the color choices. Sometimes, I don’t “get it.” And I wonder if I should make a change. But then I plow through. Once a panel is finished, the vibrant and sometimes surprising mix of colors work well together, to keep the piece interesting and lively. All the elements in the design are stylized, anyway. None of them are an exact representation of real life. The colors on these stylized elements – and the way the elements are broken up – lend a kind of stained glass effect here and there to the whole piece. This is the current progress on the whole project. It’s around 8″ wide. 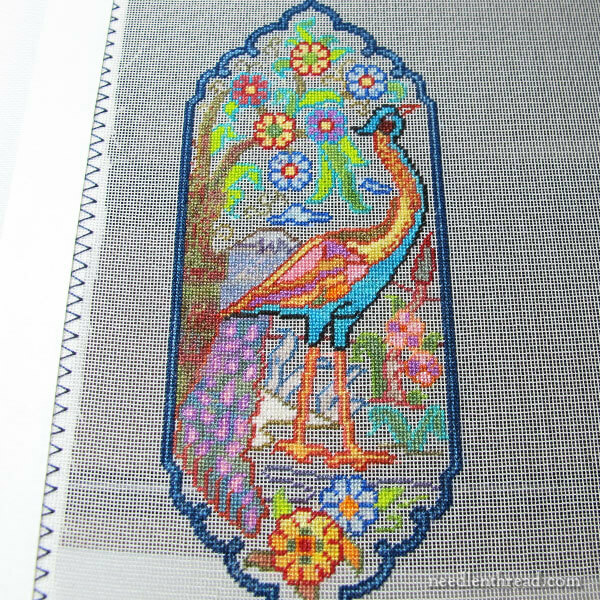 I’m using my old Needlework System 4 table stand to hold the Evertite frame that the ground fabric is stretched on. I set the stand on a small white table that’s easily stored when I’m not using it. 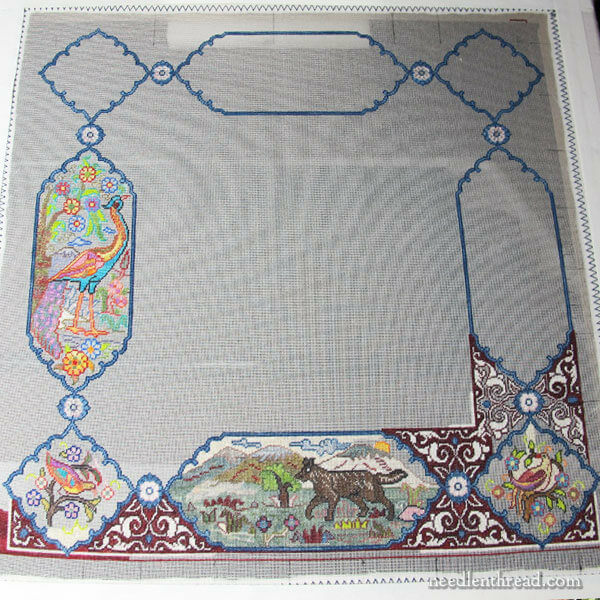 Depending on the lightening, though, the white background of the table can sometimes make it difficult to see the grid in the silk gauze. A dark background behind it makes it easier to see. So on top of my little white table, I’ve placed a large piece of dark brown craft foam that you can find in any craft store for about 49 cents. I’ve found the stuff surprisingly helpful in a number of ways! Not only does it provide a dark background to stitch against, but it keeps my table stand from slipping or moving about and it serves as a ready pincushion where I can stick a couple pre-threaded needles, ready to go. Who would have guessed such a mundane little piece of craft foam could come in so handy? You’ll find all the previous articles I’ve written on the progress of this project listed below, chronologically, if you’d like to follow the development step by step. Some stitch fun! Get out your beads! And a peak at an old pattern portfolio. We’ll also talk about time management and stitching – though it’s a tough subject to tackle! And I’ll show you some other little things I’ve got in the works lately. Today, I’m concentrating on catching up on computer work, I’m setting up the outline of a new instructional project e-book that will fit in with the growing collection in my shop, and I’ll spend some time playing with patterns. I’ve got an hour set aside for organization in the workroom and cutting fabric, an hour set aside for goldwork, and an hour set aside to overcome some problems I’m having on a developing project. And to top it all off, I have leftovers in the fridge – so no cooking! It promises to be a banner day! Hope your week is off to a grand start! Mary, that is coming along beautifully – it will be stunning when you’ve finished it. I’m sure I wouldn’t be able to do those tiny stitches even with a magnifier! So much work in just 8″, beautiful! Love your organising, especially the ‘no cooking’, I’d have left-overs every day if that were possible! Your Tree of Life project is looking really nice. I do love the bright colors. It add an interesting element to your work. I also find petti point relaxing. It is quite accomplishment to see the picture come alive. This week sounds quite bust and very interesting, looking forward to it. I really love this project Mary. I know what you mean about the colours, not at all what I would have chosen either but the clashes make the piece much more interesting and lively and give the work an antique look. Leftover day is always my favorite day for gettibg things done. Love the bit about the craft foam too. It’s always the unexpected tools that are the most helpful.